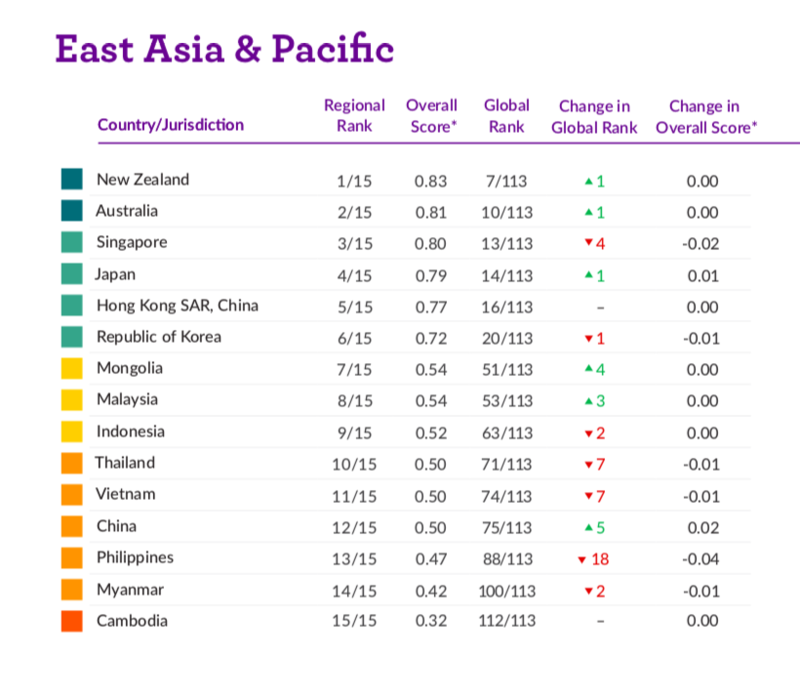 YANGON — Myanmar dropped two places in a global rule of law index from last year, leaving the country second lowest in the East Asia and Pacific region. According to the Washington-based World Justice Project’s 2017-2018 report, Myanmar ranked 100th among 113 countries globally and 14th among the 15 countries in the East Asia and Pacific region included in the index. Serious corruption in the legislature, executive branch, police, military and judiciary contributed to the low ranking, according to the report. The WJP Rule of Law Index 2017-18 presents a snapshot of the rule of law in 113 countries by providing scores and rankings based on eight factors: constraints on government powers; absence of corruption; open government; fundamental rights; order and security; regulatory enforcement; civil justice; and criminal justice. Myanmar fared badly in all eight categories; out of the 113 countries, it ranked 107th in open government, 110th in fundamental rights, 109th in civil justice, and 107th in criminal justice. Among the 15 countries in the region, Myanmar’s fundamental rights ranking was 15th, while it ranked 14th in terms of civil justice, criminal justice and open government. The report cited limits on the legislature and judicial system as the main areas in which government powers are constrained in Myanmar. Corruption, a lack of effective investigations and slow and ineffective adjudication are main reasons for the weakness of the criminal justice system, it said. Crime, civil conflict and violent redress are the major causes for the lack of order and security in the country, the report found. The country scores and rankings used to compile the rule of law index are derived from more than 110,000 household surveys and 3,000 expert surveys conducted globally, according to the World Justice Project.